"My children, their dad and grandparents all love the CDs we use them in the car, at home and especially at bedtime.."
You can purchase our CDs securely online by clicking on the link below to our PayPal store. 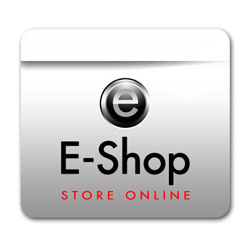 You do not need a PayPal account, payment can be made with your regular credit or debit cards. At Tots on Tour we recognise the important role songs and rhymes have in supporting our young children’s language learning experiences. As such, songs and rhymes are used in the Growing Talk Together programme to help to make language learning fun and interactive. 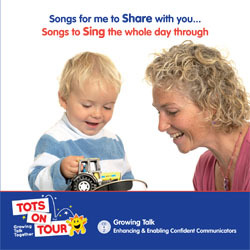 We hope you and your children enjoy the songs on the Tots on Tour CDs, we are not professional musicians but parents who enjoy singing together with our children. There is no accompaniment and the songs have been sung slowly so that you and the children can hear the words and the children can join in. 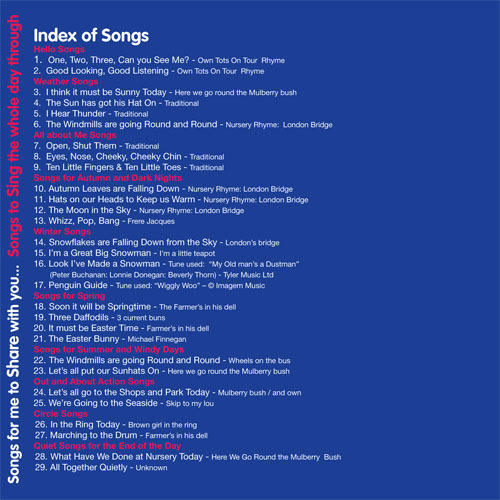 The songs are all sung to well-known tunes but the words have been changed to suit young children’s interests. We hope you too will feel free to change the words as you share different activities together, this will make the songs personal to your child. Wherever you are, take the chance to sing and talk together, it doesn’t matter whether we can sing in tune- it’s the being together that really matters. "My children, their dad and grandparents all love the CD, we use it in the car and for our bedtime songs"
"It's great having the CD because it means all the family get to hear songs, her dad doesn’t get to go to the groups very often but when he does he can join in too - he loves it!" "We play the Tots CD every day, Luke asks me to put the Tots Music On"
"The Tots CD is just the best!! We have worn it out, we now make up lots of our own songs and it's shown me just how easy it is to do that and I’m not a great singer"